The use of khaki for military dress was developed in India the inventor was Lieutenant (afterwards Lieutenant General Sir Harry) Lumsden, who raised "The Queen's Own Corps of Guides" in December 1846. Route Marching. 2nd Battalion Queen's 1879, Peshawa, India. Lumsden took the view that the border banditti could be best dealt with in a manner which they would well understand, if his own men wore their native style clothing, rather than adopt the semi-European dress then current in the Indian forces, and which the infantry battalions of the Punjab Frontier Force raised at the same time as the Guides were wearing. 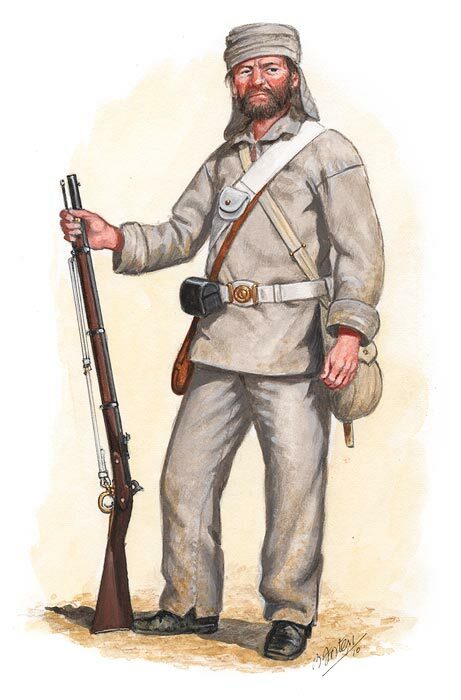 No attempt at uniformity appears to have been made until the Corps had been in existence for more than a year, when they adopted a smock and wide pyjama trousers made of coarse home-spun material, a cotton turban, and over all in the cold weather, jerkins of sheepskin and wadded cotton jackets. All were dyed locally with the product of a dwarf palm known as mazari, which possessed the property of colouring white cloth a drabbish grey; an indigenous method of producing camouflage clothing developed by the tribesmen as the result of constant vendettas and domestic wars. The leather jackets, however, dyed unsuccessfully with mazari so mulberry juice was used instead, which produced a yellowy drab shade. This was the origin of drab or khaki uniform. Camouflage clothing for those engaged in hostile operations where concealment afforded a prime factor to success was not a new military idea. Its first use on any scale was during the colonizing wars in North America, two regiments then being dressed in short brown coats to make them less conspicuous in the woods. 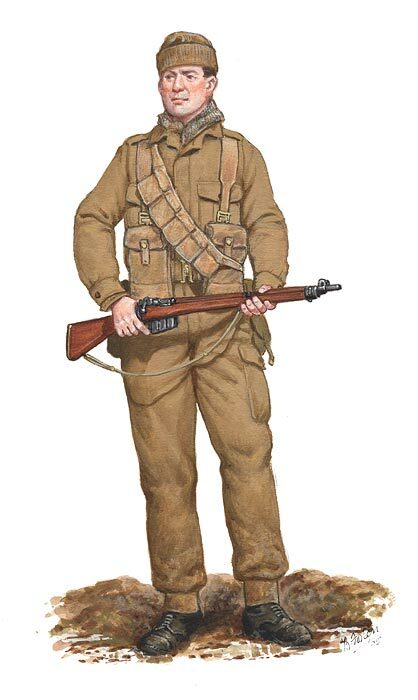 Then came the development of the rifleman dressed in dark green, operating as a scout and a sharpshooter to deal with the snipers who greatly harried the troops. 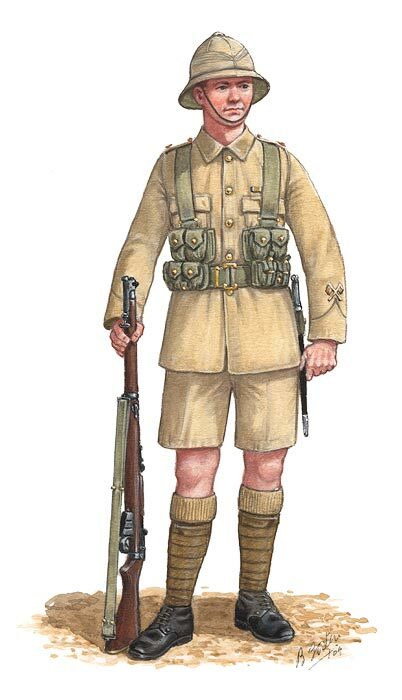 Rifle regiments were subsequently formed, whose chief characteristic in tactical operations was concealment hence no colours were carried to mark the rallying point, no polish or pipe-clay which would show them up. So thus for a time green became the principal colour for concealment in the armies of the world, including that of India. Khaki, however, was best suited to the barren rocky mountains and plains of the Indian North-west. All the units of the Punjab Frontier Force save one, - "Coke's Rifles" who stuck to indigo green - adopted khaki shortly after the Guides established it. Practically all the units hastily raised in the Punjab for service during the Great Mutiny 1857-58, wore it at that time. 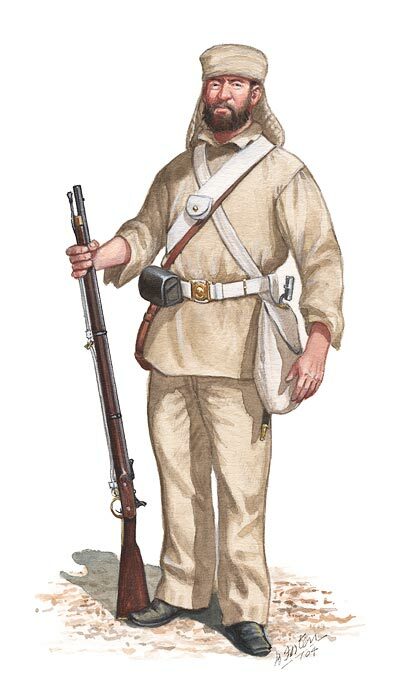 White uniform dyed dust colour was also then taken into use by British units, the first being the 52nd Foot, later the 2nd Oxfordshire and Buckinghamshire Light Infantry, at Sialkot on the 25th May 1857. During the Siege of Lucknow, which began in July 1857, archivists have recorded that the 32nd Foot, which became the 1st Duke of Com wall's Light Infantry, dyed their white uniforms an earth colour to make themselves less conspicuous. These two, however, despite what may be said to the contrary, were not the first British units to wear khaki, as the 2nd Battalion Highland Light Infantry wore drill doublets so coloured, during the Kaffir War in South Africa in 1851-53. These, however, were isolated instances. And, what is more, khaki, except in a few instances, went out of general use in India as soon as the Great Mutiny was over. It was re-introduced as a working dress in 1861 to the abhorrence of the parade ground soldier, who saw it abolished in favour of white three years later. 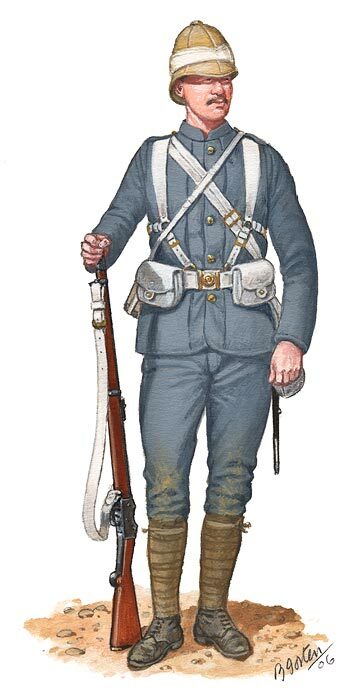 White drill, dyed khaki on the spot, was used by all troops who took part in the Afghan War of 1878-80 - the lessons taught by the red-coated battalions passing through the frontier defiles in the war of 1839 had been learnt. After this war khaki became the official service dress in India. It was dyed regimentally, all kinds of pigments being used for the purpose - tea, coffee, mud, curry-powder. Each corps had its own recipe, some of which smelt to high heaven when dyeing operations were in progress. Fast-dyed khakis invented by Spinners of Manchester were patented in 1884 but were not adopted in India for some years, the Queen's Own Corps of Guides continuing to dye their own until 1904. 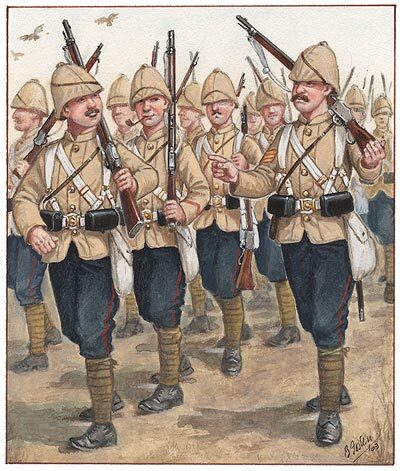 Grey was the first British choice for active service, and soldiery so dressed were sent to Egypt to serve alongside khaki-clad troops from India during the campaigns of 1880-82. For the re-conquest of the Sudan, 1897-98, all the troops were uniformed in khaki, and it was this campaign which really brought about its establishment as universal service dress for the British Army. And so by the time of the second Boer War in 1899 the word khaki - the Persian for dust colour - had begun to find a place in English dictionaries. The Americans started the adoption of khaki in the early nineteen-hundreds, Japan in 1905, the French following suit for their colonial forces about 1910, the Belgian and the Spanish armies in 1919. It has become more and more universal, and a British War Minister when pressed to return the troops to "coloured magnificence, said "the uniform outlook gets drabber and drabber and will continue to do so".